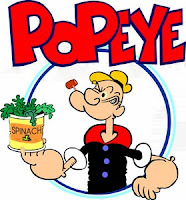 The cartoon character of Popeye was created in 1929. If you are not familiar with him, he's the sailor man who eats a can of spinach and grows huge muscles and saves the love of his life, Olive Oil, from danger. Wow. Back in 1929, I'm sure Popeye's creator could not forsee the obesity epidemic that is facing the youngsters in the world today. But, somehow E.C. Segar created this character that speaks volumes in messages that could help change the health of our future populations: EAT YOUR VEGETABLES, FIND GREATNESS IN YOURSELF. Nuff said. This salad is an awesome main dish or side dish. The warm dressing makes all the difference- it softens the spinach slightly and has a terrific flavor. In a nonstick skillet over medium high heat, heat pancetta strips until they become slightly crispy. Add 2 Tbsp water, red onion slices and mushrooms. Continue to heat for ~5 minutes, until onions and mushrooms soften. In a small bowl, whisk together vinegar, honey, flour and 3 Tbsp water. Add mixture to skillet with pancetta, onions and mushrooms and heat until thickened. Remove from heat. In four bowls (if serving as a side dish) or 2 large bowls (if main dish), divide spinach leaves and cherry tomatoes evenly. Pour dressing mixture over salad, evenly dividing dressing, onions, and mushrooms. Garnish with feta cheese (as desired).